After sale costs of solar thermal systems represent a significant part of the overall costs of the delivered solar heat. In practice, high stagnation loads have a strong impact on the maintenance efforts, which impair the cost-efficiency and generally the attractiveness of solar thermal installations. 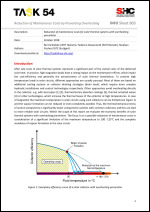 To prevent high temperature loads in solar circuits, different approaches are usually pursued. Most of them are based on additional cooling systems or collector draining strategies (drain back), which require more complex hydraulic installations and control technologies respectively. China's market demand for solar energy products vary greatly, resulting in a large number of product models of production enterprises; large number types of the raw material, which leads to the high cost of raw material procurement, causes great difficulties to the production organization. An effective way to reduce the production and procurement cost is to reduce the number of products, so as to reduce the number of raw materials. The reduction of support materials and installation costs by prefabricated mounting brackets is another way to reduce the cost of the balcony installation solar system. Solar thermal systems are state-of-the-art devices to cover part of the heat demand for the domestic hot water supply and space heating of buildings. Depending on the system design and the heat demand more or less intensive stagnation periods can occur. Usually high stagnation loads require a complex hydraulic system design, affect the operational safety and lead to high maintenance efforts, which impair the cost-efficiency and the general attractiveness of solar thermal installations. This document lists the minimum information needed for the definition of a reference system. 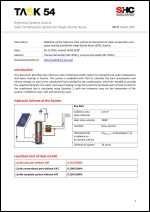 A reference system is a solar thermal system serving as benchmark for any other solar thermal system having the same fractional energy savings with respect to the levelized costs of heat (LCoH). 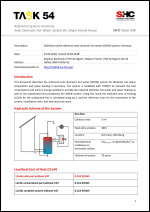 This document describes the reference drain-back domestic hot water system for multi-family houses in France. It lists the minimum information needed for the definition of a reference system. 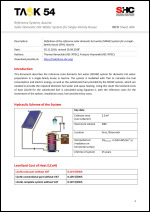 A reference system is a solar thermal system serving as benchmark for any other solar thermal system having the same fractional energy savings and the same scheme (drainback for multifamily buildings) with respect to the levelized costs of heat (LCoH). Task 54 has permitted to investigate installation costs among installers by distributing questionnaires in Austria, Switzerland, France, Romania, Denmark, the Netherlands and Germany. Besides, complementary data have been provided by German Authorities to deepen this database. From this work, several indicative lessons can be presented in terms of costs. 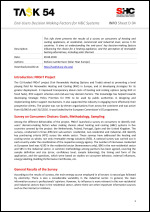 Task 54 investigated obstacles in installation of solar-thermal systems and developed recommendations for improvement of the installation process by evaluating respective questionnaires from installation companies in Austria, Switzerland, France, Romania, Denmark, the Netherlands and Germany. From feedback by 23 installers from 7 countries, recommendations and wishes for working with solar thermal systems can be deduced. 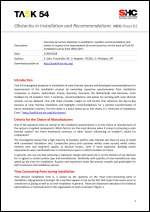 This info sheet provides insight on soft factors that influence the day-to-day business of solar thermal installation and highlights recommendations for a positive transformation of future installation routines. The info sheet is a direct follow-up to info sheets D 1 “Overview of Installation Costs” (http://task54.iea-shc.org/info-sheets). 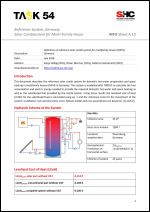 This document describes the reference solar combi system for domestic hot water preparation and space heating in multifamily houses (MFH) in Germany. The system is modelled with TRNSYS to calculate the fuel consumption and electric energy needed to provide the required domestic hot water and space heating as well as the substituted fuel provided by the combi system. 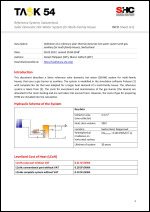 Using these results the levelized cost of heat (LCOH) for the substituted fuel is calculated using eq. 1 and the reference costs for the investment of the system, installation, fuel and electricity costs. System model and cost assumptions are based on  and . The potential to reduce market prices of turn-key domestic solar thermal systems in Switzerland was recently analysed within a study financed by the Swiss Federal Office of Energy. 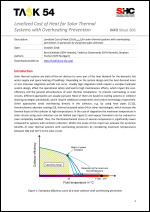 The study focussed on the cost effect of new technological approaches regarding single components and the whole heating system. 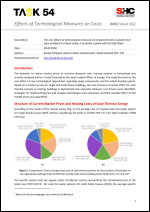 Based on a market survey for single and multi-family buildings, the cost structure of actual offers for solar thermal systems in existing buildings in Switzerland was analysed. Relevant cost drivers were identified, strategies for implementing new and cheaper technologies were proposed, and their possible effect on the market prices was quantified. The EU-funded FROnT project (Fair Renewable Heating Options and Trade) aimed at promoting a level playing field for Renewable Heating and Cooling (RHC) in Europe, and at developing strategies for its greater deployment. It improved transparency about costs of heating and cooling options (using RHC or fossil fuels), RHC support schemes and end-user key decision factors. This knowledge has helped towards developing Strategic Policy Priorities for RHC to be used by public authorities in designing and implementing better support mechanisms. It also supported the industry in engaging more effectively their prospective clients. The project was run by eleven organisations from across the continent and was active from 01/04/14 until 31/12/16. It was funded by the European Commission’s IEE programme. Reviving solar thermal is not only a matter of cost reduction but also one of visibility. New marketing strategies and ways to inform about the technology are crucial elements for strengthening the market for solar water heating. 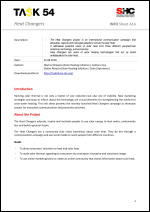 This info sheet presents the recently launched Heat Changers campaign as showcase project for innovative communication and promotion activities. In the framework of the IEA-SHC Task 54 appeared the need of assessing the costs of the heat produced by solar thermal systems over their life time in order to compare different designs and technological solutions with one another. The levelized cost of heat (LCOH), a measure based on the concept of levelized cost of energy, widespread in the electrical power sector, was chosen. 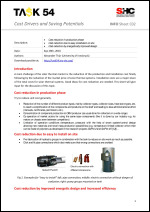 This info sheet builds on the work of the FRoNT project  who laid the foundations for the application of the method to any heating technology. 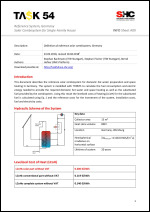 It aims at detailing the methodology to calculate the levelized cost of the heat substituted by solar thermal energy. Furthermore, an extension of the concept is suggested in order to estimate the cost of the heat generated by the entire solar assisted heating system, or the conventional sources of heat supply. 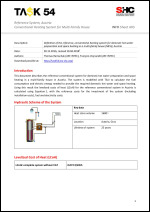 This document describes the reference conventional system for domestic hot water preparation and space heating in a single-­family house in Austria. The system is modelled with TSol to calculate the fuel consumption and electric energy needed to provide the required domestic hot water and space heating. Using this result the levelized costs of heat (LCOH) for the reference conventional system in Austria is calculated using Equation 1, with the reference costs for the investment of the system (including installation costs), fuel and electricity costs. 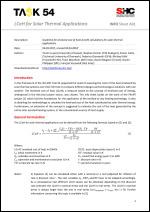 This document describes the reference conventional system for domestic hot water preparation and space heating in a multi-­-family house in Austria. The system is modelled with TSol to calculate the fuel consumption and electric energy needed to provide the required domestic hot water and space heating. Using this result the levelized costs of heat (LCOH) for the reference conventional system in Austria is calculated using Equation 1, with the reference costs for the investment of the system (including installation costs), fuel and electricity costs. 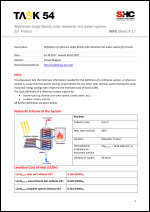 This document describes the reference solar domestic hot water (SDHW) system for domestic hot water preparation in a single-family house in Austria. The system is modelled with TSol to calculate the fuel consumption and electric energy, as well as the substituted fuel provided by the SDHW system, which are needed to provide the required domestic hot water and space heating. Using this result the levelized costs of heat (LCOH) for the substituted fuel is calculated using equation 1, with the reference costs for the investment of the system, installation costs, fuel and electricity costs. 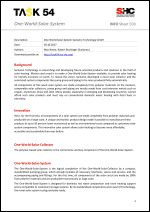 This document describes the reference solar combined (combi) system for domestic hot water preparation and space heating in Austria. The system is modelled with TSol to calculate the fuel consumption and electric energy, as well as the substituted fuel provided by the combisystem, which are needed to provide the required domestic hot water and space heating. Using this result the levelized costs of heat (LCOH) for the substituted fuel is calculated using Equation 1, with the reference costs for the investment of the system, installation costs, fuel and electricity costs. 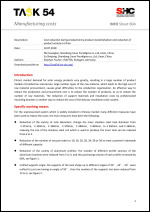 This document describes the reference solar domestic hot water (SDHW) system for domestic hot water preparation in a multi-­-family house (MFH) in Austria. 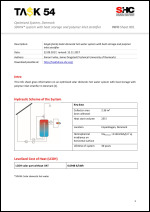 The system is modelled with TSol to calculate the fuel consumption and electric energy, as well as the substituted fuel provided by the SDHW system, which are needed to provide the required domestic hot water and space heating. Using this result the levelized costs of heat (LCOH) for the substituted fuel is calculated using Equation 1, with the reference costs for the investment of the system, installation costs, fuel and electricity costs. 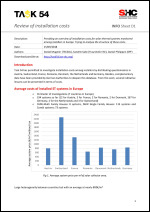 This document describes the conventional reference system for domestic hot water preparation and space heating in single-­-family houses in Germany. The system is modelled with TRNSYS to calculate the fuel consumption and electric energy needed to provide the required domestic hot water and space heating. Using this result the levelized costs of heating (LCOH) for the conventional reference system for Germany is calculated using Eq. 1 and the reference costs for the investment of the system, installation costs, fuel and electricity costs. 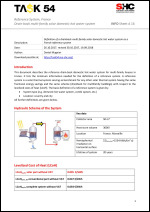 This document describes the reference solar domestic hot water (SDHW) system in Germany. 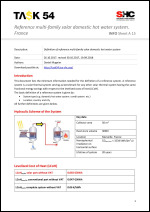 The system is modelled with TRNSYS to calculate the fuel consumption and electric energy needed to provide the required domestic hot water as well as the substituted fuel provided by the SDHW system. Using this result the levelized costs of heating (LCOH) for the substituted fuel is calculated using Eq. 1 and the reference costs for the investment of the system, installation costs, fuel and electricity costs. 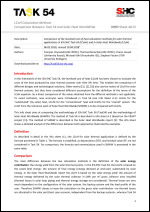 This document describes the reference solar combisystem for domestic hot water preparation and space heating in single-­family houses in Germany. The system is modelled with TRNSYS to calculate the fuel consumption and electric energy needed to provide the required domestic hot water and space heating as well as the substituted fuel provided by the combisystem. Using this result the levelized costs of heating (LCOH) for the substituted fuel is calculated using Eq. 1 and the reference costs for the investment of the system, installation costs, fuel and electricity costs. 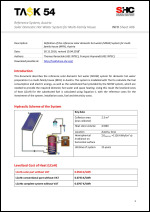 This document describes a Swiss reference solar domestic hot water (SDHW) system for multi-­-family houses that uses a gas burner as auxiliary. The system is modelled in the simulation software Polysun  with template No. 8a that was adapted for a larger heat demand of a multi-­-family house. The reference system is taken from . The costs for investment and maintenance of the gas burner (the device) are allocated to the room heating and are not taken into account here. However, the costs of gas for preparing DHW are included into the calculation. 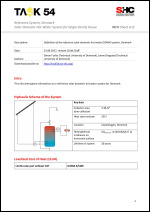 This info sheet gives information on a reference solar domestic hot water system for Denmark. 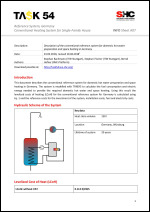 This info sheet gives information on an optimized solar domestic hot water system with heat storage with polymer inlet stratifier in Denmark. Sunlumo Technology is researching and developing future-oriented products and solutions in the field of solar heating. Mission and creed is to make a One-World-Solar-System available; to provide solar heating for literally everyone on earth. To realise this vision, Sunlumo developed a novel solar collector and the associated system components like pump group and piping to be mass-produced fully automatically. Due to the specific characteristics of polymeric materials (e.g., variety of property profiles, ease of processing, mass production capability, freedom of design) this material class has been used to replace metal parts and components in various industrial sectors. 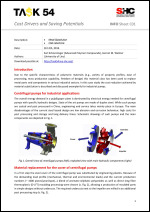 In this case study the cost reduction achieved by material substitution is described and discussed exemplarily for industrial pumps. A main challenge of the solar thermal market is the reduction of the production and installation cost finally following by the reduction of the market price of solar thermal systems. Installation costs are a major share of the total costs for solar thermal systems. Good ideas for cost reduction are needed. This sheet will give input for the discussion of this topic.